Windows are an integral part of the indoor comfort, safety, and energy efficiency of your home. Whether you open your windows to let in a nice breeze or simply use them to view the outdoors, it’s very likely that you use them daily. Old windows can be difficult to open and can often be an eyesore – both from the interior and exterior of your home. Older windows also tend to leak air, although your windows don’t have to be old to fail. Many new construction homes utilize builder-grade windows when they are built to cut costs. These windows are usually of poor quality and can start to fail in as little as 5 years. Experts estimate that 70 percent of energy loss occurs in windows and doors. Are your window frames rotting? Can you feel a breeze through your closed window? Do your windows no longer open, close or lock properly? It’s time to consider purchasing replacement windows. While replacement windows are an investment, they will ultimately cost you less in energy costs and give your home a beautiful, refreshed appearance. While the options for replacement windows can be overwhelming, it’s important to understand how a window frame is constructed, what material is used and the cost of each type. Not only are there many differences between fiberglass and vinyl window frames, but there are a few key characteristics that separate Stanek vinyl replacement windows from other vinyl windows. In this blog post, we review and compare the difference between fiberglass and vinyl windows. Cost: Fiberglass windows are much more expensive than vinyl windows because of a longer and more complicated manufacturing process, adding significant increases in time and labor costs. Vinyl window manufacturing is a much simpler process, which makes them more affordable. The actual window material that each is constructed of also affects the cost. At Stanek Windows, we’re committed to helping you achieve your home improvement goals and offer financing options to make vinyl replacement windows even more affordable. Maintenance: Fiberglass windows tend to chip, which may result in having to apply new paint. You can also paint the entire window frame at any time to change the look. Standard vinyl windows can also chip and crack after an extended amount of time. 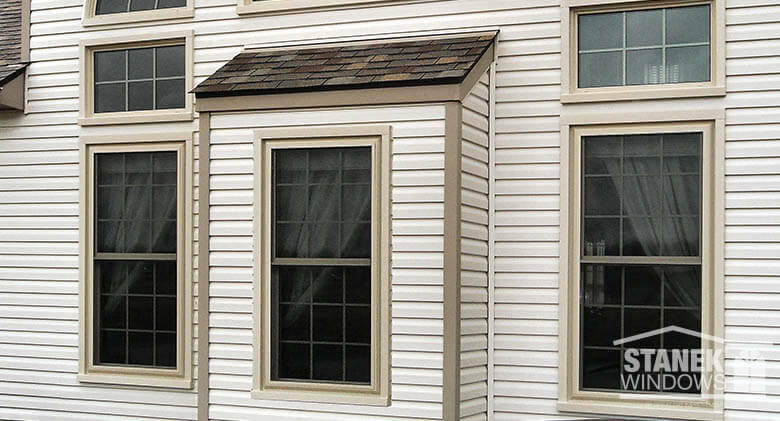 However, Stanek’s premium vinyl replacement windows utilize uPVC material which helps resist chipping and cracking and are reinforced with a composite structural enhancement material that provides structural integrity. Vinyl windows are not really made to be painted after they are manufactured and many vinyl window companies only provide a handful of exterior color options. 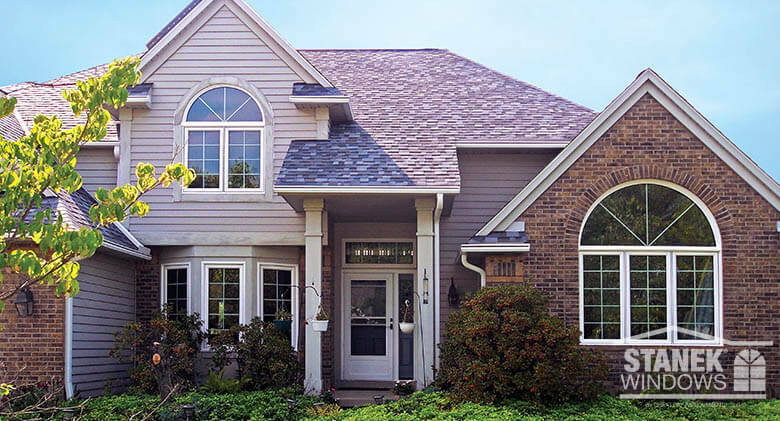 When you purchase Stanek Windows, your exterior color options are endless as they can be manufactured in any color to match your home’s exterior. Frame insulation: A fiberglass window frame has less insulation than a vinyl window frame, which can lead to air, water and dust infiltration. A typical vinyl window frame may be foam filled to help with insulation, but will lack structural integrity. 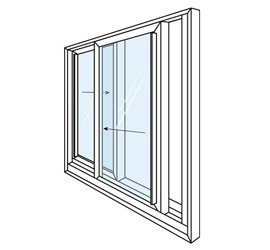 Stanek’s vinyl window frames are built with multiple chambers and bulb seals to help insulate the window frame and increase energy efficiency. Frame construction: Over time, fiberglass windows tend to weaken at the corners of the window frame, and most vinyl window frames do not offer the structural support necessary to last a lifetime. However, Stanek vinyl replacement windows are built to last using FIBERMAX® reinforcement and a fusion welding process, which is the strongest and most energy-efficient way to construct a window frame. There are many options when searching for a replacement window company. At Stanek Windows, we offer the best value for your investment. Our windows are engineered for performance and built to last, while offering unsurpassed beauty and endless custom options. Stanek vinyl replacement windows are manufactured using unplasticized vinyl (uPVC), a premium vinyl, which is 8 times more resistant than typical PVC. This uPVC virgin vinyl has a strong resistance against chemicals, sunlight and oxidation from water and will not chip, rot or rust, giving you the most out of your investment. Our windows feature full FIBERMAX® reinforcement, which is exclusive to Stanek windows and increases overall window strength, reduces thermal conductivity and ensures long-term performance. FIBERMAX reinforcement is guaranteed for life not to warp or sag. Are you looking for replacement windows that are virtually maintenance free? Stanek vinyl replacement windows are easy to care for, energy efficient, and never need to be sanded, painted, stained or refinished. 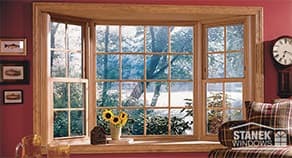 Stanek brand windows are beautiful, durable, built to last and affordable. Unlike fiberglass windows, vinyl replacement windows do not have to be painted. Our windows are fully customizable to match your home. Stanek uses a state-of-the-art color-matching booth that allows us to create unlimited exterior colors for our windows – all we need is a color swatch to match. Why Choose Stanek Replacement Windows for Your Project? Custom designed and manufactured: All window and door openings in your home are not the same size. After you choose a window style, glass option, finish and color, we custom manufacture each window to fit your window opening precisely. Having your windows sized to fit each specific opening increases energy efficiency, since it limits the space through which air can escape. 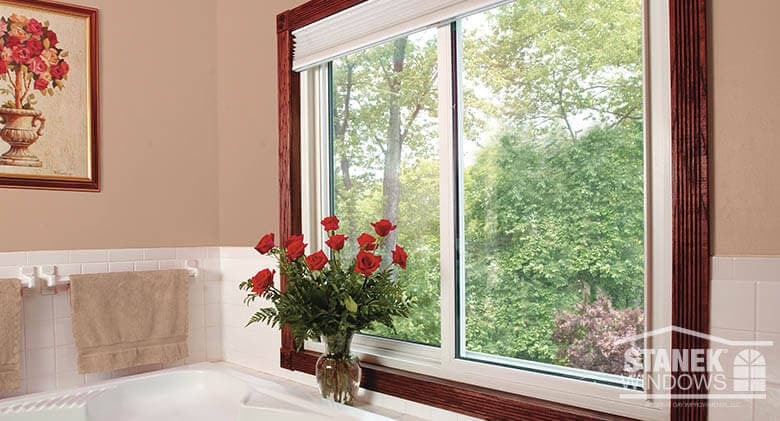 We do it all: Unlike most window companies, Stanek controls the process from beginning to end. We design with unsurpassed beauty and endless custom options. We manufacture your windows so they’re engineered for performance and built to last. We install your windows with our expert, mess-free installation and cold weather installation processes. We offer exceptional service and our windows are independently tested and certified. We guarantee your windows. If you ever have any issues, we take care of it – not a third party. 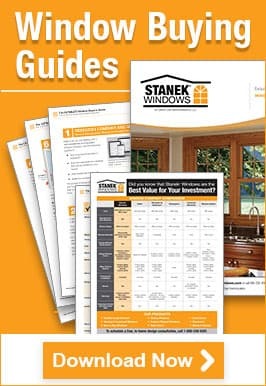 Best Value of Your Investment: Check out our window company comparison chart to see what separates Stanek Windows from the competition. If you’re ready to install premium Stanek vinyl replacement windows in your home, give us a call or schedule your free, in-home estimate online today!